All of the comics I am looking at today were released on my mom's birthday. Happy birthday mom! Here's some superheroes! 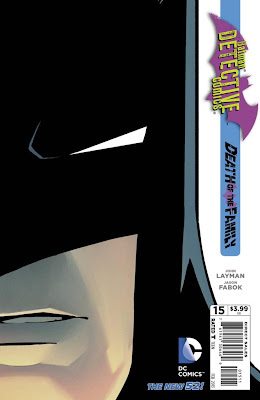 Detective Comics #14 - "Clayface is out of Arkham--out of his mind--and what's already turned into a bad night just got exponentially worse." So Batman was caught in the middle of a fight between Penguin and Poison Ivy last month that resulted in Ivy calling on Clayface to help her out! How does she do this? She breaks him out of jail and MARRIES him! Or at least...that's how he remembers it. Knowing Ivy as we do, well..she has a way with men, even if they happen to be made out of clay! On the other hand...there may be a way to break Ivy's control over Clayface...all it involves is a little detective work and a NEW COSTUME VARIANT!! I was pretty excited! 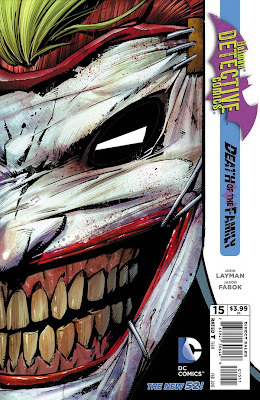 While Batman tries to deal with Clayface, the Joker's decided to recruit the Penguin into his plans to toughen up Batman by taking away all of his crutches. This may mean Mr. Cobblepot's downfall and is guaranteed to be bad news for the Bat-family...but how can a little Arctic bird say "No" to the Clown Prince of Crime?? Even though it might put his whole criminal empire in danger? Well, that's not all that's going on in the DCU...Action Comics, Green Arrow and more after the JUMP! Action Comics #14 - "It's hard to prepare for an enemy who can strike at any moment in your life." So remember last month when Superman fought a Multitude of weird angel-like beings on Mars? We discover this month that he only REMEMBERS that happening...the Mars mission isn't even planned to launch for another 2 years! Confused? It's all due to an angry little dude from the 5th dimension with godlike powers and a grudge against Superman! No...his name is NOT Mr. Myxyzptlk! Although, you guessed right...that little dude IS involved as well! Thing is, good old Myxyzptlk is more of a victim here...to another impish 5th dimension troublemaker going by the name Vyndktvx! Worlds' Finest #7 - "Not of this Earth, but hardly from Hell...unless Apokolips is another name for it, and Darkseid the devil?" 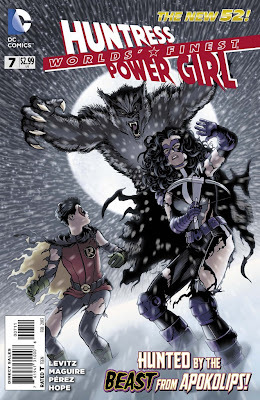 Last issue, Huntress, with an assist from special guest/bratty little brother Damian "Robin" Wayne discovered and tracked two digital trails leading from a computer terminal in Gotham in an attempt to find out who's been funnelling money from Wayne Enterprises. 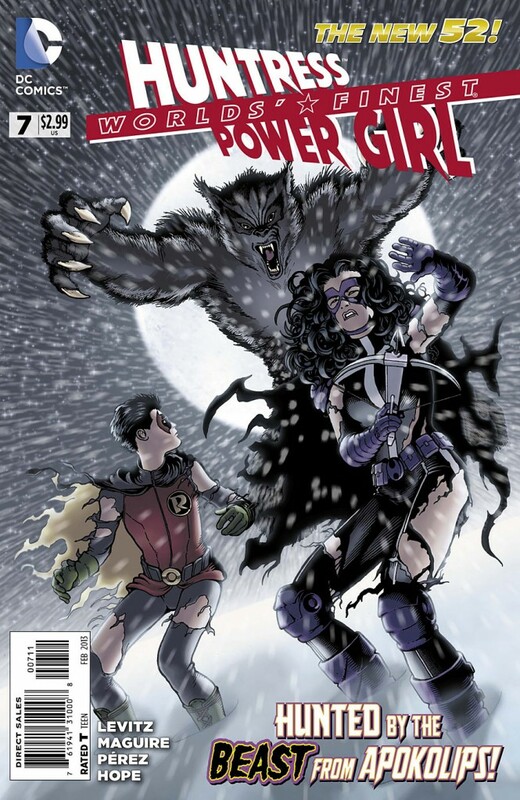 Now Huntress and Robin travel to the origin point of the first trail, which leaves Power Girl to investigate trail number two! Earth 2 #7 - "Thing is, you without that ring...jade power of the Earth within you or not...you're just a target." Oh, also this issue...we get the first hints of this world's Red Tornado! Not quite built yet, and FEMALE! Interesting...so yeah! Lots happening on Earth 2! 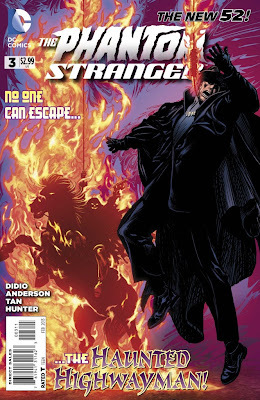 The Phantom Stranger #3 - "Do you think this is a game? Do you have any idea who I truly am?! What I am capable of?" The Phantom Stranger has been summoned to the home of Terrance Thirteen...not by any mystical powers, but rather by the use of a telephone! Not without good cause, though...Terrance Thirteen is the last surviving member of a family that is haunted by a vengeful spirit and he needs the Stranger's help to avoid being yet another victim of the Haunted Highwayman!! 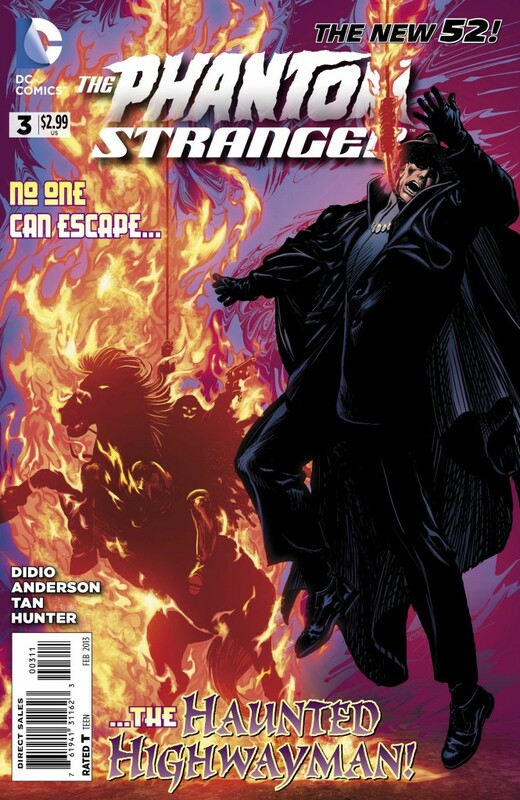 Unfortunately for Terrance Thirteen though, the Phantom Stranger really doesn't care about his problems at all! If it's not a mandated part of his penance, the Stranger is NOT interested...at least, that is the case until the Haunted Highwayman actually shows up and starts attacking! When it's kill or be killed, what choice can there be but to fight? 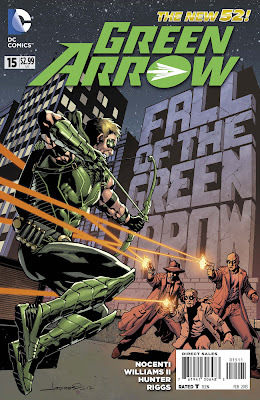 Green Arrow #15 - "Doesn't make sense. Guns are best off at the bottom of the ocean. My head hurts." Green Arrow is dazed and confused and I feel the same after trying to make some sense out of what's going on this issue. That's because in the continuation of the Hawkman story from last month (which appeared in Savage Hawkman #14 and which I did NOT read) I guess Ollie got himself a pretty bad knock on the head. Now he's home alone in Seattle and wandering around disoriented but still trying to do good...specifically by stealing a truckload of illegal guns from a one-eyed, icepick-themed gunrunner named Harrow (Harrow, meet Arrow...Arrow, Harrow!) and dumping said truck in the harbour! This results in Harrow putting a $50,000 hit on Arrow, thus making his life even more miserable and getting a chuckle out of yours truly. 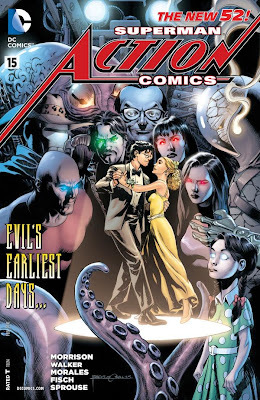 Before Watchmen: Comedian #4 (of 6) - "Hello, Darkness...Here's the surprise. Come to talk with you again. I can see for miles..."
Eddie Blake is still in Vietnam fighting a stupid war for reasons which have become increasingly unclear. Not only that, he may be doing TOO GOOD of a job fighting the war, as his superiors are forced to remind him that he's there to be a figurehead...a symbol...but not an actual soldier. They are worried the war may end too soon, and apparently there are "economic considerations". How does Eddie react to that? Well, he takes a hit of acid and sets off to END the Vietnam war his own way. Really, he didn't have that much choice...the acid blotter had a happy face on it! 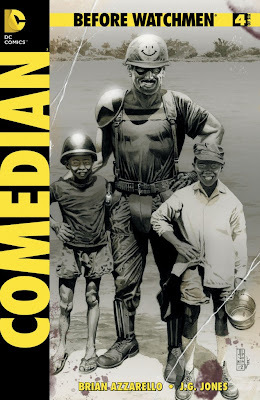 What's a poor Comedian to do? Before Watchmen: Minutemen #5 (of 6) - "With Bill dead and Sally gone, that left the four of us. I'm still not sure why we didn't call it quits right then." The saga of the original Minutemen grows ever darker and more bleak as time marches on towards the inevitable dissolution of the once idealistic band of so-called "heroes". 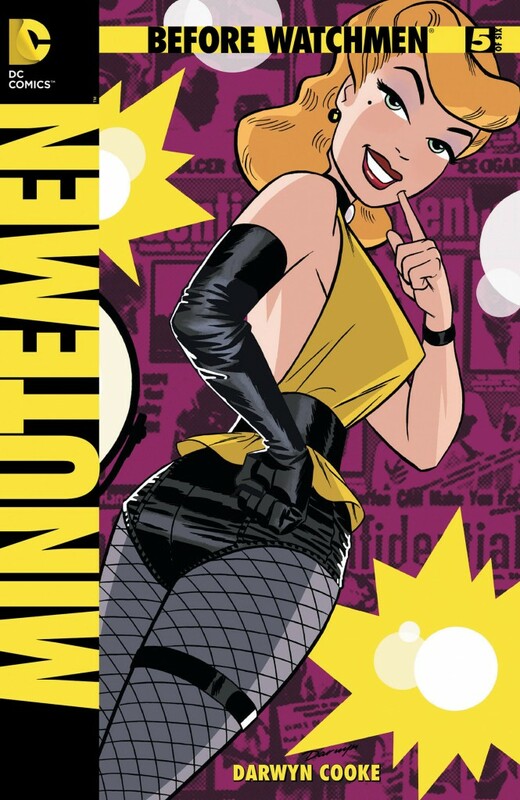 This issue mainly focuses on the final mission of the remaining four Minutemen, after Sally "Silk Spectre" Jupiter quits the team and both the Silhouette and Dollar Bill have died before their times. The remaining Minutemen are alerted to a Japanese plot to cause a nuclear meltdown somewhere in New York City as revenge for WWII! Someone's got to do something! 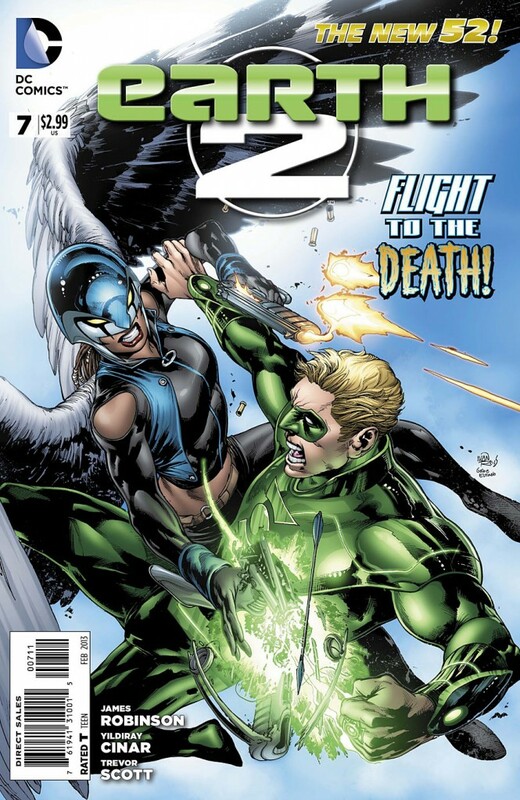 Also in this issue, Hollis "Nite Owl" Mason continues the Silhouette's last investigation, where she hoped to stop a mysterious assailant from kidnapping and murdering children. However, he isn't uncovering too many answers and the ones he IS finding may be hard for him to accept! Undoubtedly, we'll learn more about this...next issue! And that's about it for another week! Oh, here's the inside cover of Detective Comics #15. If it looks familiar, well, it should. It's not EXACTLY the same as the cover of Batman #13 but I had to double check to be sure! Anyhow...Only 14 days until Christmas! Better get shopping...and what better place than your local comic book store tomorrow for the once-in-a-lifetime chance to buy New Comics on 12/12/12! Since EVERYONE needs more Batman in their lives! Oh hey, if you like Leonard Cohen, well, so do I! Find out how much over at Stryder's Dementia this week! That's it! I'm done! Go home! Love you guys! See ya next week! Exclamation points!! !